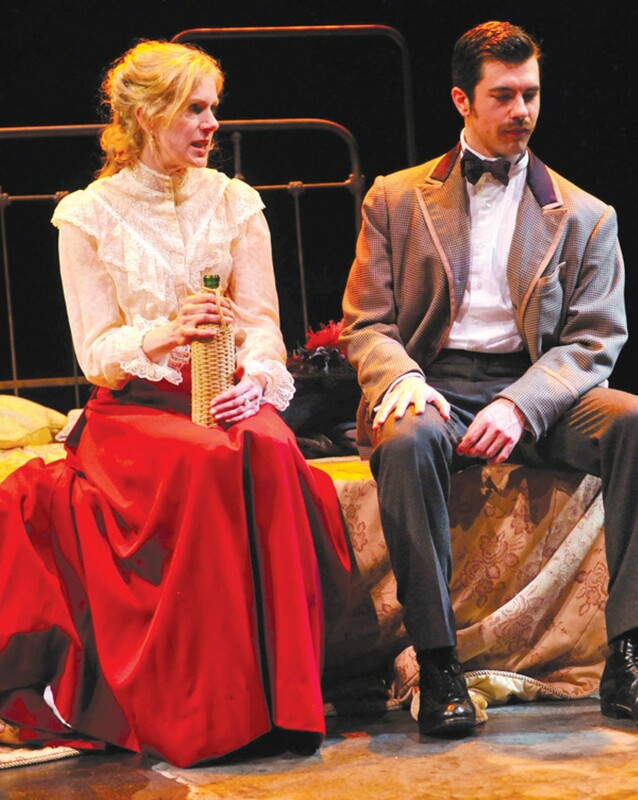 A new resurrection of Tennessee Williams features frazzled spinsters and reptilian mothers. Small gestures convey big things in Aurora's iteration of The Eccentricities of a Nightingale. The plays of Tennessee Williams teem with cruel, controlling mothers and rattled, willowy spinsters, many of whom are hard to portray without devolving into caricature. Despite the odds, actresses Beth Wilmurt and Marcia Pizzo handle their roles with alacrity in Aurora Theatre's new production of The Eccentricities of a Nightingale. That's no small task. The play is a close study of human foibles and social mores, so most of the action occurs through dialogue. It was apparently one of the most oft-revised in Williams' oeuvre, and that near-excruciating sense of precision bleeds into the script. Drama is a medium in which everything is over-pronounced and amplified; literature is medium in which small gestures convey big things. This iteration of Nightingale, overseen by Aurora Artistic Director Tom Ross, errs more toward the latter. No surprise, then, that the male love interest specializes in bacteriology, a field that requires him to gather unpleasant substances and examine them under a microscope. Played by Thomas Gorrebeeck, the young doctor John Buchanan is dashing in a rather standoffish way, with an accent that falls somewhere between Great Britain and Southern noblesse. Punctilious elocution isn't his only disarming feature. John also has a thick Antebellum mustache, and a way of licking his teeth that makes him appear crafty. He appears to be one of the only people who smokes cigarettes in the small town of Glorious Hill, Mississippi. He gazes at Alma Winemiller, the "nightingale" of the play's title, with a mix of childish curiosity and noncommittal adoration. Alma (Wilmurt) is never quite sure of his intentions, and it's easy to see why. Gorrebeeck's tightly circumscribed range of expressions insures that his feelings are always concealed. He could be sweet on Alma, or he could be humoring her in a borderline-paternal way, or perhaps he just finds her entertaining. And she suspects as much. The daughter of an Episcopalian minister and a batty housewife (Amy Crumpacker), Alma is free-thinking and proudly single in a time and place where such things weren't appropriate — particularly for women of a certain age. Married, instead, to her professional life as a singer and vocal teacher, she consorts with other social misfits and spends long nights gazing wistfully at John Buchannan's bedroom window. She speaks in long, divagating monologues that make her seem neurotic but highly literate. And, as her father the Reverend Winemiller (Charles Dean) points out, she's in danger of becoming "peculiar." In a way, Wilmurt spent much of the last two years studying for this role, albeit unwittingly. In that time she's played a whole range of frazzled women, from Connie in Jack Goes Boating to Mel, the bereaved mother in God's Ear. Tall, thin, and bone-blond, she's able to seem a lot more brittle and delicate on stage than she probably is in real life. And though Wilmurt showed in this play that she can't easily acquire a Southern accent (she's the only actress who doesn't have one, although it could have been intentional), she does have a wonderful way of handling long, elliptical sentences. Sheer fragility allows her to turn a potentially insufferable character into a sympathetic one. As such, she's a perfect foil for John's mother (played by Pizzo), an expired Southern belle who indulges her son almost to the point of smothering him. She's a real-life Cruella de Vil, complete with the small, buttony features and long, bony arms — all the better for encircling prey. The scene in which John reluctantly accepts a maternal foot massage is one of the best in the play. Mrs. Buchanan tackles her son's exposed footsies with carnal glee, while Alma watches through a nearby window. You can almost hear Freud cackling in the background. It's clear, from the set design alone (crafted by Liliana Duque Piñeiro), that neither John nor Alma could thrive in Glorious Hill. It's a small bend-in-the-road town with two churches (one Episcopalian, one Roman Catholic), a country courthouse, a fountain festooned in blossoms, and a population of "five thousand souls," Alma enjoys saying, "and an equal number of bodies." It's a place that breeds conformity and doesn't cotton well to geeks or weirdoes, like the ones who attend Alma's weekly cultural club meetings. And, naturally, it's got a cordoned-off section for honky-tonks and penny arcades, suggestively named "Tiger Town." Piñeiro knew the best way to represent such environs: flat. Thus, most of Glorious Hill is rendered in a perspective drawing, with the rectory far in the background and the fountain jutting out front. A single branch dangles from the ceiling, for all scenes that take place outside. Against this intentionally plain backdrop with its light pastel color palette, the characters seem large and vivid. The cultural club meeting is high comedy, dominated as it is by characters in fruit hats and mismatched attire. Mrs. Buchanan is so viscerally reptilian that she elicited audible shutters from the audience at last week's press opening. Meanwhile, the romance between John and Alma is wonderfully fraught, and just tender enough to be believed.